In October 2009, UC Cooperative Extension in Los Angeles County was awarded a grant from the “UCLA REACH U.S. Legacy Project” to implement the “East Los Angeles Nutrition Project” - an exciting new initiative that aims to increase the availability of fresh fruits and vegetables for residents of East LA through healthy corner store and restaurant “makeovers.” East LA was chosen for this project not only because Cooperative Extension is located in this area and has strong ties to the community, but also because residents have poor access to healthy, affordable food. This predominantly low-income, Latino community has many fast food restaurants, few grocery stores with high quality fruits and vegetables, and one of the highest rates of childhood obesity in the county. A team of dedicated East LA residents have met monthly at the UCCE office to discuss what they would like to see in terms of healthy food offerings in their neighborhood. In order to make their voices heard, these residents were given cameras and asked to go out and document their food environment. The photographs and narrative descriptions were presented at a community event, which was hosted by Cooperative Extension. Local residents, business owners, community agencies, youth and representatives of elected officials attended the event. The photos were a depiction of the problems facing this community. Everyone agreed that something needs to be done to improve the availability of healthy, affordable food for local residents and to address nutrition-related health problems facing many families in East LA. 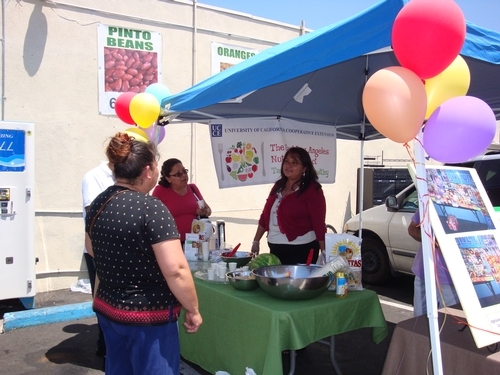 On Saturday, May 8, Cooperative Extension staff and members of the “East Los Angeles Nutrition Project” met at Super Chavez, a locally owned corner store, to conduct recipe demonstrations and free food tastings for the public. The purpose was to draw attention to the high-quality, low-cost produce available in the store. The event was fun and well-received by the community. Cooperative Extension plans to hold similar events at food establishments throughout the East LA area. Staff members hope to provide technical assistance, nutrition expertise and free advertising opportunities to businesses who participate in this project – all in an attempt to bring lasting change to a community in need of a healthy makeover one corner store and restaurant at a time! For more information about this project, please contact Los Angeles County Nutrition, Family & Consumer Sciences advisor Brenda Roche at bkroche@ucdavis.edu, (323) 260-3299. Local residents learn about the "East Los Angeles Nutrition Project" from project facilitator Aba Ramirez. This transaction is just one example of the markets that have been opened in the Sacramento and Fresno areas for farmers of Southeast Asian descent. With funding from the USDA National Research Initiative, the University of California has established partnerships with five Sacramento-area school districts and three fruit distributors to bring local fruit into more local homes, school cafeterias and restaurants. Produce Express works primarily with restaurants and school districts. Two other fruit distributors working with UC, Alchemist Community Development Corporation and Soil Born Farms Urban Agriculture & Education Project, are offering the locally grown strawberries and other fruits and vegetables at neighborhood farm stands. The Alchemist, for example, is buying produce from small-scale farms and selling it in a working-class west Sacramento neighborhood each Saturday from 10 a.m. to 2 p.m.
Fresh, local fruit and vegetables become available within walking or bike-riding distance in low-income neighborhoods. A wide variety of fresh fruits and vegetables are available at one stop. Small-scale farmers have a new outlet for their produce, but aren't required to staff their own stands, as they would at a traditional farmers market. People can pay for the produce using electronic benefits cards. Anywhere in Sacramento, consumers can play a part in supporting local, family farms by buying strawberries at the farm stands. 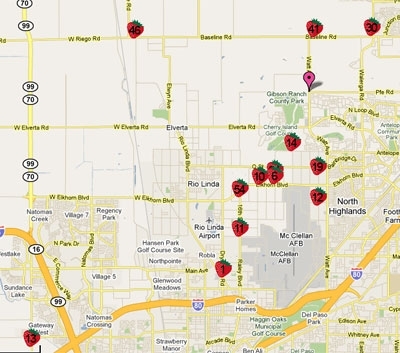 To find a farm, see the Google map of the strawberry farms in Sacramento. In most California homes there are few commodities more precious, or more taken for granted, than clean tap water. We use it without hesitation for drinking, cooking and washing produce. However, recent news reminds us that not everyone can take clean water for granted. In rural California, where some households rely on well water, up to 2 million people have been exposed to unhealthy levels of nitrates in their water at some time during the last 15 years. Synthetic fertilizers used in agriculture are major contributors of nitrates to our water, but a growing number of farmers are taking steps to reduce this problem by adopting micro and drip irrigation technologies, and by cultivating noncrop vegetation (buffer strips and cover crops) and “constructed wetlands.” All these measures reduce not only nitrates but many other pollutants from runoff. "Nitrate problems start when applied fertilizer moves outside the root zones of plants," says Toby O'Geen, UC Davis soil resource specialist. "If nitrate reaches the root zone of actively growing crops, much of it is taken up by roots. But because of its high mobility, nitrate occurring outside the root zones can be transported by irrigation or rain as surface or subsurface runoff. " Technologies like drip irrigation deliver water and fertilizer precisely to root zones. From 1991 to 2001, Califiornia growers decreased surface irrigation (furrow and flood) about 28 percent and increased sprinkler and drip/microirrigation about 28 percent (Orang et al 2008). 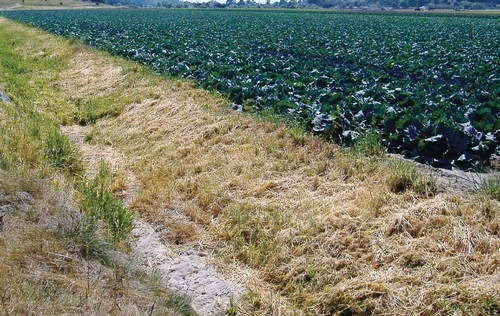 In addition, growers are using buffer strips, cover crops, vegetated waterways and constructed wetlands to purify water, reduce erosion, and remove hazardous contaminants such as pesticides, metals, pathogens and fertilizers. The Farm Bill funds some of these programs through the Environmental Quality Improvement Program and the Wetland Reserve Program. "Farmers receive technical advice and funding to take marginal land out of production and put it into noncrop vegetation and creation of habitat, including constructed wetlands," O'Geen said. Another way that agriculture helps remove pollutants of all kinds, including not only fertilizers and pesticides but pathogens, is through natural filtering by rangelands, including oak woodlands. (See details of how oaks help nitrogen cycling.) More than two-thirds of California's drinking-water supply passes through or is stored in oak woodlands. In fact, rangeland in California (land suitable for grazing livestock) comprises more than half of the state's 101 million acres and typically is not fertilized. It forms our major drainage basins – filtering the drinking water for millions of people. (see California Agriculture). help improve water quality by filtering. By assigning a simple, 15-digit identification number to cows, UC researchers can track each one from conception to carcass, garnering valuable data for studies on cattle fertility, genetics, and health, and helping to select breeding animals with desirable beef characteristics such as flavor and tenderness. In today’s beef market, an individual cow may change ownership many times during its lifetime as it travels from the ranch of its birth, to stocker and feedlot, to slaughterhouse, and finally supermarket or steakhouse. In the process, valuable data is lost along with the ability to “trace back” particular steaks to the original cow. For several years, UC Davis researchers have been attaching a round, electronic ear tag to each newborn calf in the research herd at the UC Sierra Foothill Research and Extension Center, in the California foothills northeast of Sacramento. The ear tags contain each cow’s unique radio-frequency-identification number, which is scanned with an electronic wand; the system is similar to that used to keep track of packages being shipped overnight or library books. 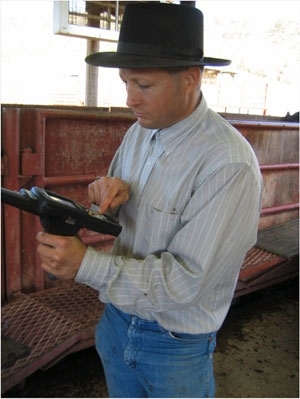 Cowhands use a handheld device to enter information when the cattle are processed, which is transmitted via remote-access antennae to centrally located computer databases. The integrated data-collection system is being used to undertake sophisticated studies on cattle genetics, with the ultimate goal of improving cattle breeding. 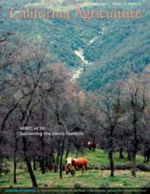 “The genotype of some beef and dairy cattle may be better suited to grass-based productions systems,” UC Davis Cooperative Extension Specialist Alison Van Eenennaam and colleagues write in the April-June 2010 issue of California Agriculture journal. “It may also be possible to select animals that are able to grow to given size using less feed, or that are more resistant to certain diseases.